Jerusalem Dictionary replaced Super Milon as a new product name and works in Windows 95-98-ME-NT-2000-XP. In addition, Jerusalem Dictionary will paste words and phrases into any Hebrew supporting word processor (that supports right to left typing like Dagesh, DavkaWriter, or Accent Express). It suggests the correct spelling if you wrote the word with a spelling error. It allows cross checking the translations to pin point the closest to the intended meaning. It includes thousands of phrases and expressions with translations. It includes thousands of verb tables, fully conjugated, showing their classification, root and other information. This an invaluable tool for students of the Hebrew language. It works inter-actively with the best Bible code programs. Operating in the background, it can be brought up with a simple keyboard command, for instant use. Click on the links to go to a page showing graphics of Jerusalem Dictionary. The power of the Main Screen is readily apparent. Just type in a word in either English or Hebrew and get the translations and synonyms. Then use cross-check to get a better understanding of the nuance of meaning of the word. While Super Milon will work with any program, Interactive Mode with CodeFinder:Millennium Edition or A.B.C. Decoder PRO allows you to paste translations directly for codes search without any typing. When you find a word you might want to use, you can browse the dictionary for other words with close spellings. English has words that can be used as both nouns or verbs, and Super Milon will translate these instances showing both the correct Hebrew nouns and verbs to use. Often overlooked, the over 8000 fully conjugated verb tables in Super Milon will allow you to use the correct Hebrew verb spelling. Unrivaled anywhere for learning correct Hebrew verb usage. The same thing works for English verbs. You can open the verb tables for English instead of Hebrew, and use it to apply the correct English verb in a word processor, even if you don't want to use the Hebrew verb tables. 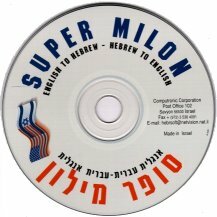 Super Milon was also designed to aid Hebrew speaking people in learning English. You can order Jerusalem Dictionary by itself, or as part of a package deal with CodeFinder: Millennium Edition, A.B.C. Decoder, or Bible Codes 2000. (save $$$ when purchased as a package deal). 128-bit secure encryption for online ordering, VISA, Mastercard, AMEX, or Discover cards accepted. or go to CodeFinder: Millennium Edition information page. or go to Bible Codes 2000 information page. or go to A.B.C. Decoder information page. $79.95 for Canada, Europe or other places (International Air Mail with 7-10 day delivery). Codes in the Bible is the authorized distribution agent in North America for CodeFinder: Millennium Edition, A.B.C. Decoder, and Bible Codes 2000; and handles Super Milon/Jerusalem Dictionary in order to offer special package prices for purchasers of these top Bible code programs. We offer technical support and use these programs ourselves.